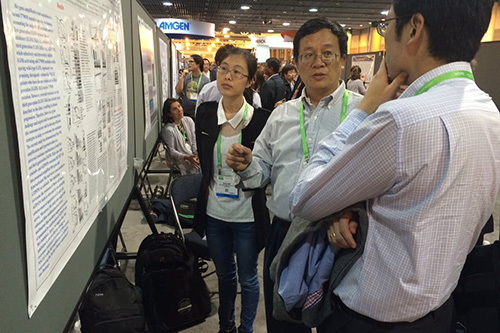 Shi-Yong Sun, professor in Emory's Department of Hematology and Medical Oncology, discusses poster on EGFR inhibitor resistance at last year's meeting. More than 80 Winship investigators have authored some of the 6,000 papers that will be presented at the annual American Association for Cancer Research meeting being held April 1-5 in Washington, D.C. The theme of this year's conference is "Research Propelling Cancer Prevention and Cures." Winship experts will discuss topics ranging from the use of combination therapies in targeting mutations in head and neck tumors to finding new approaches to the prevention of metastasis in patients with non-small cell lung cancer. Paula Vertino, PhD, leader of Winship's Cancer Genetics and Epigenetics Research Program, will co-host a mini symposium on April 2nd titled "Niches and Routes of Metastasis."